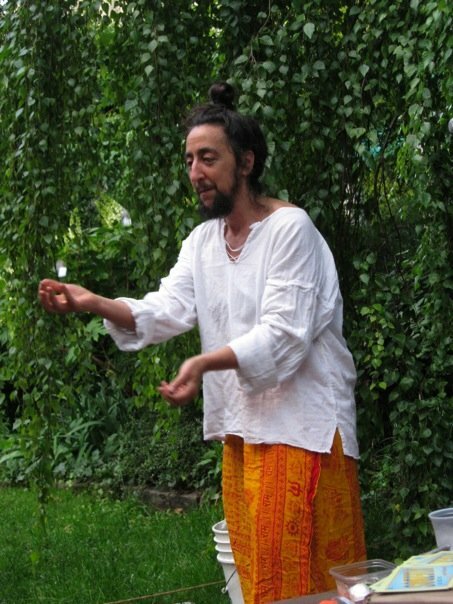 2008 — such a hot year, MC Jennifer Miller juggled ice instead of fire! 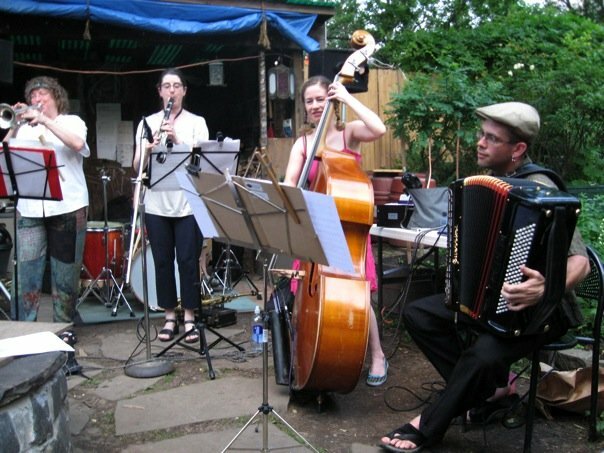 2008: our first year at El Sol Brillante Garden was a hot one! New York State enacted Marriage Equality in July 2011. 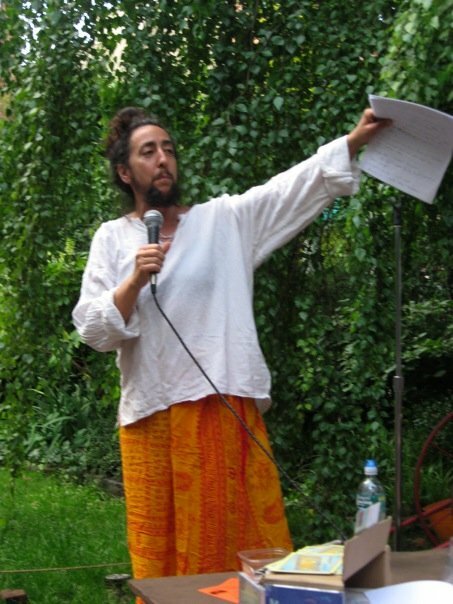 The following June we celebrated, with Deb Margolin as our MC! 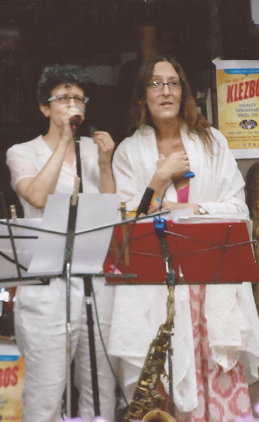 KlezBiGay Pride 2011 marked the Triangle Shirtwaist Fire centenary through very local, personal and musical histories. 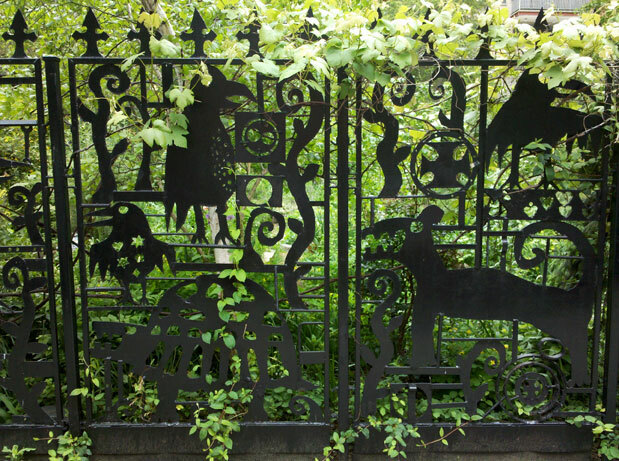 Many Triangle factory lived in what today is called NYC’s East Village, the “Lower East Side” where El Sol Brillante Garden is located – and our bandleader Eve Sicular had recently discovered that her grandfather Joseph Bronstein was born on the very same East 12th Street block as this garden where Isle of Klezbos planned to perform yet again. 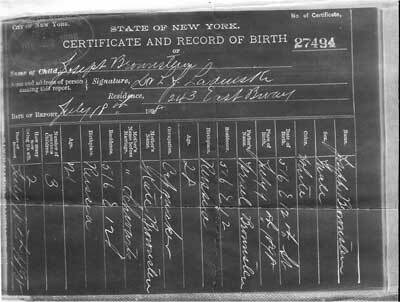 Joe’s birth certificate also listed his immigrant father’s garment industry occupation: “capmaker.” Klezbos sextet was joined by ‘sibling’ octet Metropolitan Klezmer (with the band’s own arrangement of nearly-forgotten Yiddish disaster ballad Di Fire Korbunes, published in 1911 just blocks downtown), as well as MC Julian Fleisher [photo: Kathy Lo]. 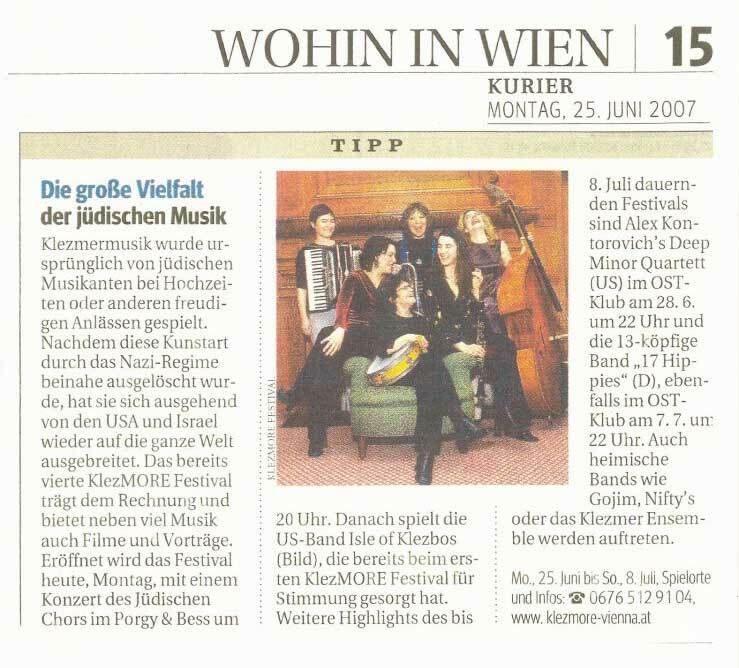 In 2007 KlezBiGay Pride came to Vienna: Isle of Klezbos played a return engagement for KlezMORE Festival, opening night gala at Porgy & Bess nightclub. 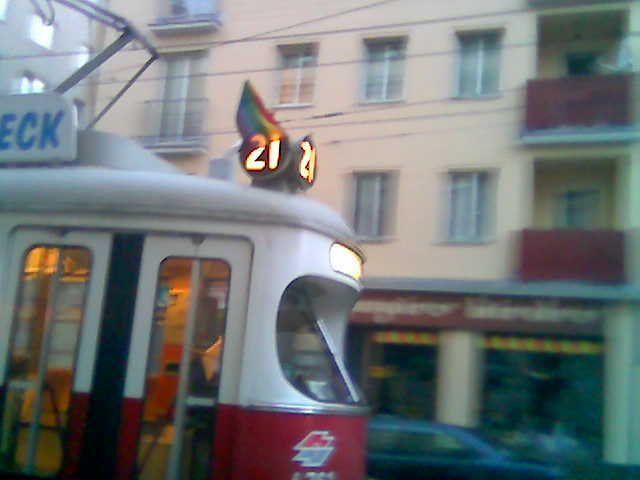 The band arrived to find the city’s trolley cars already decked out in rainbow flags for June. 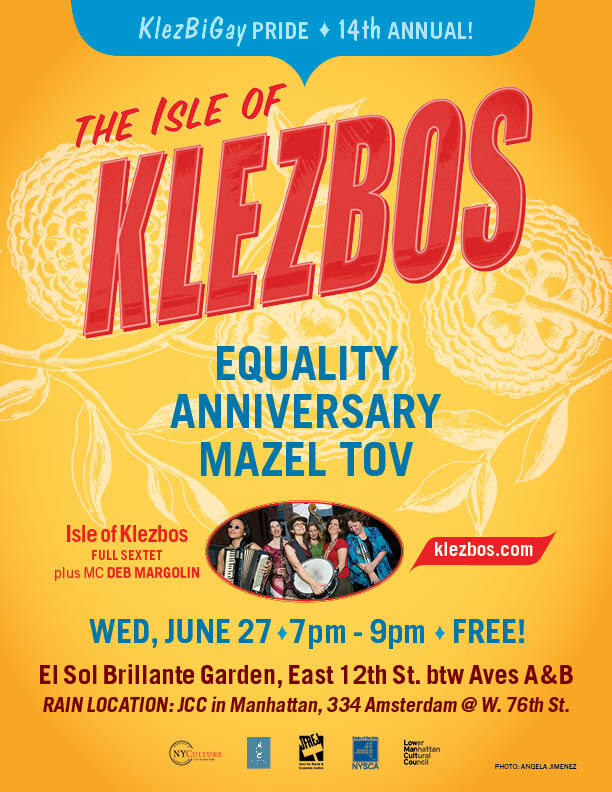 Isle of Klezbos created the first KlezBiGay Pride show in June 1999 at CB’s 313 Gallery (the folk club offshoot next to punk rock CBGB, learning only years later that owner Hilly Kristal - big Klezbos supporter from the beginning - was a nephew of Yiddish singer Sidor Belarsky). 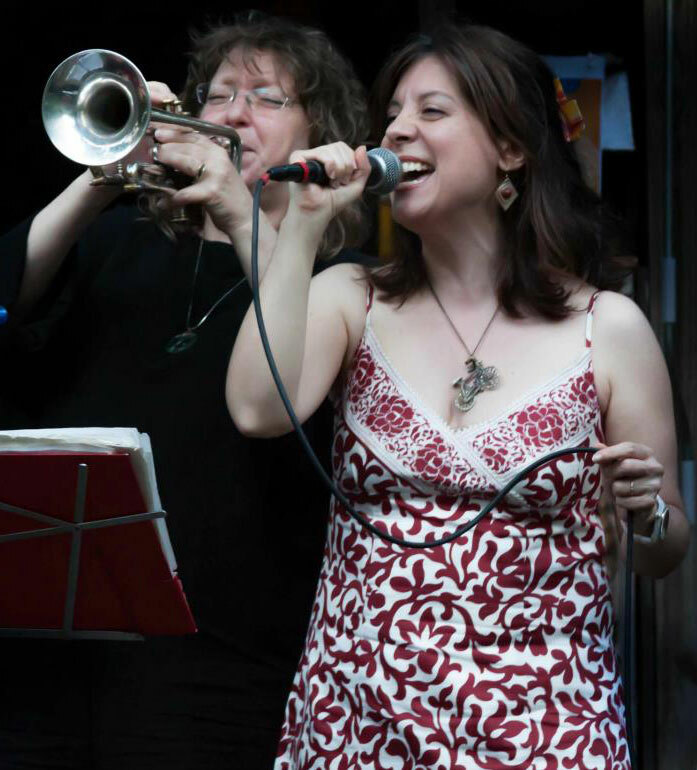 The following June saw another KlezBiGay Pride triple-header, Klezbos sharing the bill with groups fronted by two Klezbian bandmates, Rachelle Garniez’ Fortunate Few and Pam Fleming’s Fearless Dreamer. 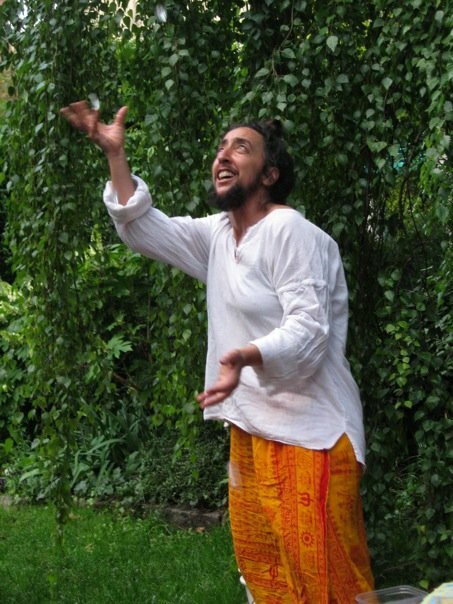 Each June since has seen another unique celebration too, with venues including Bryant Park (NYC LGBT Pride Rally), City Winery (Father’s Day Brunch), and “export” shows from Brooklyn’s Park Slope (Barbes) to Vienna, Austria (Porgy & Bess/KlezMORE; see above). 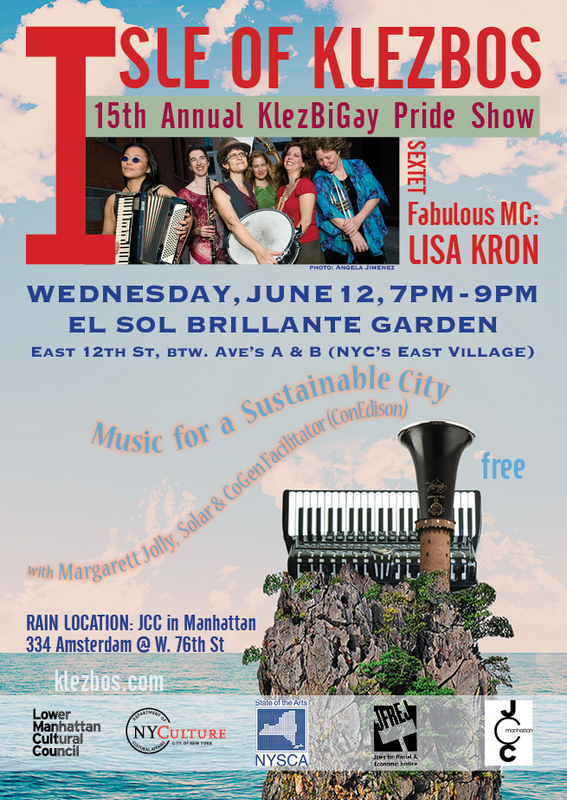 Thanks to the support of Manhattan Cultural Arts Fund, The Fund for Creative Communities, Jews for Racial & Economic Justice, and the hospitable garden members of El Sol Brillante, KlezBiGay Pride has been held outdoors on East 12th Street between Avenue’s A & B most years since 2008, weather permitting. 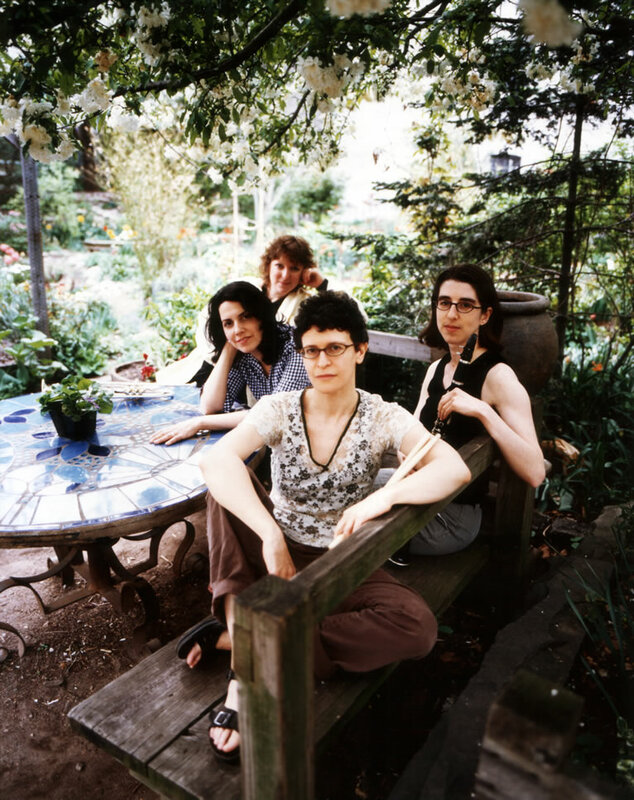 The band’s connection to this beautiful East Village venue is also seen in a feature photo shoot for an Advocate Magazine profile [Killer Klezbian, June 2004]. The theme for 2013, Music for a Sustainable City, is particularly apt for this lush urban oasis which is also home to a solar-powered fountain, Bokashi fermentation composting, and a phantasmagorical wrought-iron gate designed by environmentalist photographer Julie Dermansky; special guest Margarett Jolly will represent the growing Solar & Co-generation renewable energy programs of Con Edison. 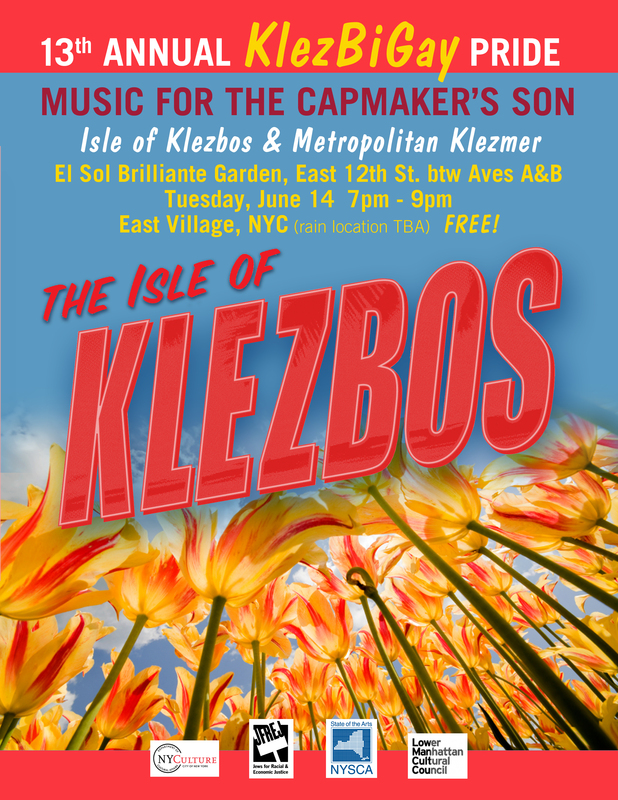 Isle of Klezbos sextet will perform two sets, one in daylight and the other after dark, with audience free to enjoy the lush foliage and eclectic seating along leafy paths of these spacious grounds cultivated for decades on former vacant lots. Over the years at El Sol, illustrious KlezBiGay Pride MCs have included Circus Amok creator/ringleader Jennifer Miller; actor/musician Julian Fleisher; Obie Award-winning actress/playwright/Split Britches co-founder Deb Margolin; and Obie winner/Tony nominee actress/playwright Lisa Kron (co-founder of The Five Lesbian Brothers) for 2013.